This is an amazing, classic 1941 Indian Four Motorcycle that cranks, runs and drives fine. It has beautiful bones but needs to be restored. What a joy it would be to bring this vintage bike back to its former glory. The old engine cases are complete and have never been cracked! If you have any questions regarding the Four or if you have any opinions you would like to share you can do so using the space below that has been provided by GoGoCycles Used Motorcycle Classifieds . In my opinion there is not another old bike with more potential than this old Indian motorcycle on this site! GoGoCycles would also encourage our visitors to write a review of the Classic 1941 Indian Four Motorcycle or share any thoughts and/or opinions to make potential buyers aware of any problems that are commonly associated with the restoration of this classic bike or to highlight its positive features and help our visitors make informed decisions. 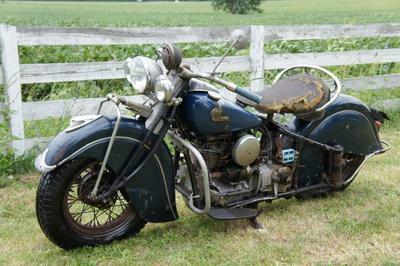 These old 1941 Model Indians are getting more and more difficult to find and this one is no longer for sale either so...good luck with finding one for yourself! I am an expat living in Thailand. Could be there -Indonesia- next day. Scammer is only interested in a deposit, correct. Scam artist and not a clever one!! Email me at richardh@ sharontelephone.com regarding the '41 Indian. Like the motorcycle. However the photograph contains some clues about location. For the fun I would be willing to wager-my 5 to your 1 this photograph was taken within 10 miles of the limits of Lexington Kentucky. Tree in the middle of what appears to be a large field of tobacco. Horses and large tobacco field on the same property or adjacent property-typical. On racehorse farm isolated trees are surrounded by a wooden fence to protects horses. Grass is turning brown but is still frequently mowed low-horse farm practice. Geologically the area is a limestone dome with a thin soil cover. So rain drains away. Some brown grass that become green again after a little rain. If this is a large horse farm the fathers and grandfathers were prominent and considered wealthy. Many buildings for storing toys and memories. Could be out of the storage to show an acquaintance or visitors and photograph. Full-Time immigrant farm workers to help move out of storage-yes. Cutting tobacco is labor-intensive so migratory workers-yes. Smiling interested workers have the chance to photograph-yes. The Father needs to sell-probably not. If for sale, maybe adult children disposing of dad's souvenirs. Yep, this is a fraud. The same bike is on other sites. I've been talking to this guy and he's only interested in scamming a deposit. Looks like the scammers are really busy. You may come to my place to see the bike.. This is a FRAUD....there is a ring of ding dongs from Indonesia trying to "sell" Indians that they do NOT own.